JD Peterson was the CMO of Trello when the company’s acquisition by Atlassian was announced in January 2017. He has also served as a marketing executive at Marketo, Zendesk, and a number of other companies here in the San Francisco Bay Area. 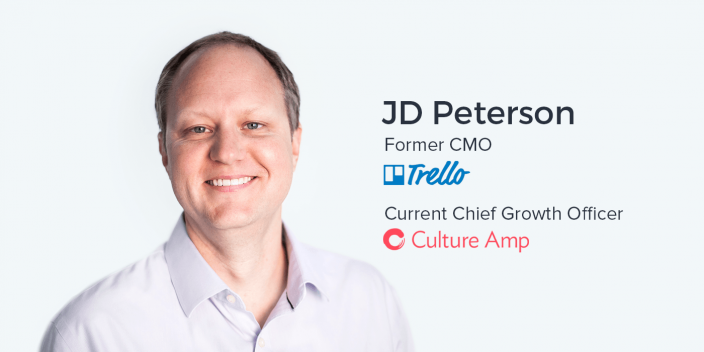 Currently, JD is working as the Chief Growth Officer of at Culture Amp, and company helping other companies become better places to work. He also is an advisor at OneReach, a cloud-based bot-building tool based in Denver. Stepping into the shoes of an organization’s marketing leader always comes with a unique set of challenges. Joining a company the size of Trello as the executive marketing leadership requires a balance of innovation and maintaining what has worked so far. Even though this doesn’t stop it entirely, there’s no doubt that it has a potential effect on the ability to innovate. The solution to this is to be reactive to your users and continue putting your customers first. Keep Your Product (and Marketing) Simple. Products that have the ability to truly deliver clear value for an user base as broad as Trello’s benefit from a simple product that is easy to understand and use for just about anything. In some cases, it might even be worth it to keep the product free to drive virality and stickiness within the product itself. At the very least, it worked out quite well for Trello. While the metrics always matter, focus on optimizing content, advertising, and any other marketing initiatives for the long game. Ultimately, this comes down to creating real value across all your marketing channels. If you’re joining an established company as a marketing executive, testing out a new marketing channel, or even solving marketing issues as an agency for one of your clients, delivering value will boost long-term KPIs for the business. Ander: It’s always exciting to interview somebody from a company that have made substantial news in the past or in the present for that matter. And today it is a pleasure to be joined here at the Instapage Headquarters in San Francisco by JD Peterson, currently the CMO of Trello. JD, it is a pleasure to have you here. JD: It is a pleasure to be here! Our first sunny day in San Francisco in a while so it was nice to walk over here. Ander: Yeah, it is. I’ve appreciated the rain. It certainly has been welcome, given the drought that we’ve experienced but at this point, I’m ready for it to wind down. JD: Me too, yeah. A few weeks, and a nice dose to get some water on the ground, but let’s move on. Haha. Congratulations! Trello was just acquired by Atlassian. JD: Yes, yes! The news just broke of the acquisition by Atlassian. Very exciting and interesting times for the company for sure and really a testament to the team that built the company, the founders, all the way through all the employees. Really a testament to all the hard work and innovation that they’ve put into it. Ander: Yeah, it’s really cool seeing a company and a tool, a product that I have been using for such a long time for so many different things. Everything from editorial calendars to project management for trips I’ve taken with friends. Ander: And, it’s pretty incredible seeing a company like that get acquired by another company which appears to be an excellent partnership. JD: Definitely. it’s funny you mentioned that because when I was looking to join a company a little while back – actually not that long ago, earlier last year – when I came across Trello. That was really the big thing that stood out to me was just about everybody I talked to, whether through my work network or personal friends, parents at my kids’ school, I would just mention, ‘You ever heard of Trello?’ and the answer was always pretty much what you gave there. And it was usually, ‘Know it? I love it! And here’s what I use it for,’ and they start giving me all the use cases. Ander: ‘I planned my wedding on Trello,’ and stuff like that. Yeah. JD: That’s a common one. Ander: But you also have worked for a number of other companies as I mentioned: Zendesk, Marketo, Scripted… There’s quite a few so I think that the best place to start with this conversation might be diving into your professional journey a little bit. Ander: How did you get into marketing in the first place? JD: Yeah, that’s actually an interesting one. You mentioned a few of the many companies, which basically means I’m dating myself and showing some age here, but yeah, around here I’m pretty much a grizzled veteran of the Silicon Valley. I’ve been working in tech companies pretty much my whole career and grew up out here in the San Francisco Bay area so I kind of fell into it naturally. I’ll maybe touch on one experience I had very early on which I think gave me the start-up bug, and then I’ll kind of move to the career in marketing. JD: One of my very first full-time jobs when I moved back to the area after college was actually a customer service job. I didn’t really know what I was getting into or much about the company. And it ended up being Hotmail, the free e-mail service that at the time was really probably the internet’s first killer app, you know, aside from just websites. We’re talking all the way back in the 90s, of course. Ander: My first e-mail was a Hotmail account. JD: And again, pretty much a common story. Hotmail was their first… By the way, I’m still the last person in the San Francisco Bay area that uses Hotmail. JD: It’s some weird loyalty thing. Yeah, people always give me a hard time about that. It’s funny. So a couple of weeks after starting, literally about two weeks, I was promoted to the manager of the customer support team that I was working on. And basically I’ve been managing people ever since. I got the management bug and the love of working and helping others in a company environment way back then. Of course, Hotmail had a pretty good exit itself. Not long after that, we were acquired by Microsoft for, I think it was about, $400 million bucks in the late 90s. I don’t know what that would equate to now. Ander: That’s a good amount of money. JD: So a good amount of money. I joined Microsoft and spent a little time there. And then decided while I didn’t necessarily want, at the time, to pursue an entire career in customer service and was wanting to get closer to the product. I had the start-up bug and wanted to get closer to the product and eventually tried some other start-ups. This was in the original dot.com crash, so some went well, some didn’t. But over time I started moving and eventually fell into a product management role. In fact, probably the bulk of my career in terms of years was spent in product management. I do still in some ways consider myself a product guy. And, that was kind of core product management, working with engineering to bring the customer’s feedback in the market. Analysis into building a road map and determining what we should build and putting together the requirements and getting that stuff launched. I did that for a while with, again, some mildly successful, some not so successful start-ups. That product management culminated in me becoming the Vice President of Products in the early days at Marketo, one of the big leaders, still a leader, and one of the early pioneers in the marketing automation space. Ander: We actually just launched a Marketo integration with our product. Ander: I totally hear you. Really powerful tool. JD: And I’m glad you did because the post-click landing page editor that we built way back when, back when I was there, I believe is still the editor that’s native in Marketo. Haha. Ander: I believe you’re right. JD: Let’s just say Instapage – no offense to Marketo – but I think that the Instapage integration will help a lot of users. Ander: Thanks! Very kind of you. It was at Marketo that I actually realized that I really wanted to be a marketer. I think that was seeing our own marketing team, led by John Miller who’s a thought leader in the B2B marketing space and has an exciting new company that he’s working on. But, I think it was seeing what he and our team there were doing, which in many ways was I think writing the playbook on modern B2B marketing and kind of creating it as they go. Seeing that, as well as what all of our amazing customers were doing. We had so many great marketers as customers at Marketo. Being able to work closely with them and seeing the things that they were doing to really drive growth in their companies, got me really excited. And then, maybe as you can tell already, I like to talk. I like to tell stories and so marketing was probably where I should have been all along. So it was there that I really got the bug for that and fortunately was able to really make a move into marketing, from the product marketing angle. After my time at Marketo I moved over to Zendesk, where I was able to really fully move into a marketing executive role and I haven’t looked back since. I had a great and amazing journey and run with Zendesk where I got to get hands-on with really just about every flavor of marketing or subgroup within marketing at various times there. The rest is sort of history. From there I went to Scripted where I did a little bit of everything including a stint as an Interim CEO for a while. And then eventually left there and moved to Trello not that long ago! Ander: Yeah, June last year if I remember correctly. JD: Yeah! Just June last year! When I joined I didn’t think it would be that soon before a big event like getting acquired but it was and still is really, really an amazing company and an amazing experience. Glad to take that journey with them. Ander: Yeah, that’s awesome. I definitely want to talk about Trello and what you were able to do there. However before we get into that, given your experience – especially as Interim CEO at Scripted – and in a marketing leadership roles at Zendesk and Marketo, I’d actually be curious to know about what it takes to build a marketing organization. I previously interviewed Rob Meinhardt who, at the time, was a partner at Toba Capital. We talked about what it means in terms of creating a culture to have a great team of employees and also how that translates into your users and speaking with your customers. But what about actually finding those employees? There are so many different channels and so many different things that start-ups and companies are exploring right now. Where do you start? Who do you start hiring? What channels do you start focusing on the most? When you’re in the traction stage, it’s obviously quite different. If you’re going to start building a marketing team, who do you hire first? JD: Yeah, it’s a great question and one that I’m asked a lot. I wish there was a perfect magic bullet answer. I do think it depends on each company but that said, there are some things that I think are somewhat universal – or at least have been my experience in the way I look at it. First and foremost, I think when you’re building a marketing team, the first thing you want to do is really… I use the expression ‘hire athletes.’ And you think of the baseball analogy – they talk about the five tool player, that person that can throw, run, hit, catch, and… I don’t know what the fifth one is. Who knows what the fifth one is? Ander: Maybe something more intellectual or something like that! Haha. JD: Haha. Maybe they have to have a brain, too. I don’t know. JD: But, somebody that’s very versatile and can do lots of different things. I think that especially in the early stages, you’re going to be figuring out what channels work. You’re going to be wanting to test things and experiment and you’re probably going to change directions a bunch of times. I think what you need on that early team is not so much the person who has, you know, ten years of super specialized experience in one particular thing, search marketing, or whatever it might be. I think what you want to find is those people who can truly not just handle it, but really thrive in a situation where they’re asked to be a generalist and truly – to use the cliché – wear many hats. The main things I’m looking for include intelligence. Does this person have a natural curiosity? Are they a smart person that can figure stuff out? And, a lot of times figure stuff out on their own because there may not be somebody there to teach them that new thing we’re going to try. Somebody who can demonstrate a certain intellectual capacity and a thirst for knowledge and learning and figuring stuff out, as well as passion. I think maybe the most important thing in start-ups in general is passion. It’s having a team and being able to build a culture where people just absolutely care about what you’re doing and what the mission is. And, people who absolutely care deeply about getting better at marketing and better engaging with your market, your customers, and those types of things. I want somebody who can get fired up about something, right? I also believe in work-life balance very, very deeply and so having somebody who has something they really care about outside of work, I think can make a big difference too. This was a lesson in many ways I learned at Zendesk, where I think that was something that we really, truly valued as a company was people that had, very strong passions, no matter what they were. JD: That’s a very generalist answer. I think if you want to get into specific roles, again, you’re going to test different channels, maybe you already know something for your brand and you’ve kind of identified a need. But all other things being equal, I think in your early team… You’re going to need a content person of some sort, right? Somebody who can write, somebody who can create pieces of content, generate interest in stuff. Might be things like we’re doing here. Might be audio or verbal. Might be pure written work. And I think journalist backgrounds is definitely something I always look for there. Ander: Well, I came from a broadcasting background. That’s how I got into marketing. JD: Exactly. Perfect. And I think that’s important because it’s it’s not just that. It’s not just an ability to write. Why I like kind of that journalist, is that ability to ask good questions and to also find the story within the story so you’re not just regurgitating the same old stuff because I think it’s important in content to always find your unique angle. In today’s world, you’re going to need to produce a lot of stuff, a lot of content, and I think somebody that can do that and do that well is definitely an early hire. I think in today’s world, as well, with marketing becoming much more data driven, much more scientific and analytical, having a marketing ops person, or at least somebody who’s very good and comfortable with numbers and testing and information and analyzing and pulling insights from information is critically important too. Somebody who is very tech savvy and can help you do everything from reporting to running experiments and tests with your website or with various channels, a very versatile data driven, operational type of person. Maybe the third would be the classic demand generation kind of thing. Again, someone who is for a generalist there because, especially in the early days of a company, I think you’re likely not going to know exactly what channels are going to work or what you’re going to need. So you need somebody who has some experience in generating leads and running different programs. Those are probably at least the starting points on a team but, yeah, generalists above all else. Ander: Gotcha. That’s awesome. Super useful. At this point, I’d actually like to move to Trello and what you’ve been doing most recently there. You joined in June, 2016. Ander: And then there was this major exit. You got acquired by Atlassian. When you joined, what was the goal? Were you just looking? Was there an exit in mind? Was that primarily why you were hired? Was it broader than that? And what was the strategy behind that goal at a high level? JD: When I got hired, no, I did not know that this event was going to come and I don’t think, or it wasn’t necessarily a plan. I think the company’s objectives and my main objectives coming in were to grow the business. Everything from employee size to revenue. I think we roughly doubled the employee size over the time that I was there. More importantly, growing revenue, active users, and all the key growth metrics that we cared about as a business. It was scaling and preparing for big growth over the future and trying to scale what we were doing now, but also find new channels and new ways to acquire customers. That was kind of the bulk of why I was brought in and what the company was focused on. We expected to, or at least had conversations and definitely was in our sights, was to have a fundraising event of some sort. In many ways, that’s what an acquisition is – it’s just a different type of fundraiser. JD: One part of it, at least, is a way to infuse capital into a business. Trello was very conservative financially. We ran the company very close to breakeven. It could have been profitable had we chosen to. But I think we saw the opportunity now to really seize this market that we were in and to capitalize on the extremely awesome, organic, huge user growth mostly from the freemium aspect of us. JD: But to capitalize on that and hit the gas pedal and really take thing to the next level quickly before competition might have caught up or market factors changed. I think there was definitely a mindset of: let’s get aggressive. Let’s grow this business. And we might need an infusion of capital to do that. I think in the process of weighing all options and looking out there, this came up. I think from the financial side, but also from a team culture, a product vision and mission fit, I think it made a lot of sense. Ander: Awesome. Yeah, absolutely. It certainly sounds like it and it’s interesting joining a company when it is past the product market fit stage, you know? It’s really working. Ander: I don’t know off the top of my head how many users there were, but I imagine it’s in the numbers of millions. The many millions. Ander: When you join a company like that, how does that inform your strategy as a CMO, shaping the marketing of an organization that has already seen quite a lot of success? JD: Maybe even going back to the earlier question, maybe my number one objective was: don’t screw this up! Ander: Yeah, that’s a totally different kind of pressure. JD: But, as funny as that sounds, I think that’s absolutely a real thing. And there is a lot of pressure, as you point out, as well. There’s been all this goodness so far. How do we start doing new things and continue to accelerate and add additional growth but not mess up what we have, not tarnish this brand, and not anger customers in any way or change their perception or the way they think about Trello? How do we grow? How do we add a lot of people to this company? How do we add a lot more customers and do a lot more things without screwing up the vibe and the mojo that we have? Ander: How does that affect the ability to experiment? Does that affect the ability to innovate? JD: I think it does. It doesn’t stop you by any stretch but I think it affects it, sure. I think you’ve got to be careful. We always had to, as cliché as it might sound, truly had to put our customers first and really think about them and how they were going to react to something, in everything that we did because we had this really amazing customer base, which, by the way, going back to why I joined the company and feeding into the strategy question here, other than a great product itself, there’s no greater asset you can have as a marketer than a lot of super happy customers. Ander: Oh, that is absolutely true! JD: Again, it sounds pretty obvious but it’s a truly amazing thing. And I think as far as how that shaped our strategy, it shaped it in a big way. How can we leverage that? How can we have these customers do the marketing for us? Word of mouth, telling their stories, everything from trying to inject more formal case studies into just showing off inspiring use cases of our customers. And, building a community whether it’s through social media or other online communities. We started to dabble in events bringing our customers together. A lot of the value we saw out of that was just customers talking to customers and really sharing the word. It’s amazing to go to one of those events. What you see all over the place was people showing each other their boards. I think that was a huge part of our strategy too, and a lot of our thinking the last six months was finding new ways to leverage that love that we had from our customers and have them help tell our story. Ander: Awesome. That’s an interesting thing with Trello. As you mentioned with the Editorial Calendar, that’s one use case. Planning out your marketing campaigns. JD: A use case, by the way, that me as a marketer never thought to use Trello until I actually joined Trello and figured that out! Ander: Yeah, it’s incredibly powerful. But you see so many different types of people using the product for different types of things, whether it’s managing your marketing campaigns, managing a launch, maybe it’s planning your wedding, or maybe it’s planning a trip with a group of your friends. Ander: We talk a lot here at Instapage about personalization, specifically advertising personalization. But the concept of marketing personalization is just very important in general. The one-to-many approach, the one size fits all approach, just doesn’t work that well anymore for a lot of different types of products. When you have a product that works for everyone, that has a universal application one way or another, how do you achieve that kind of personalization that is able to articulate the unique value proposition of such an awesome product in a specific way for a specific audience? JD: Yeah, it’s extremely challenging. I think the reality is, because of the horizontal nature and because we saw our target market as basically everybody, we couldn’t really get super personalized with a lot of our marketing messaging or a lot of the things we did. We would certainly create content and execute certain campaigns at various times where we’d focus on particular use cases or on particular departments and how they use it. But we couldn’t get super, super personalized. And, I think it was part of fundamentally how we saw ourselves – we truly saw Trello as a product you could use for just about anything. And that was really what we wanted to market to people. We certainly, and especially over the time that I was there, shifted that. We love the wedding use cases and we want people to do that. We want people to use it for those things in their personal life, anything where they’re planning something, organizing something, collaborating with others on a thing, no matter what that thing is. We want people using Trello using the free one. That’ll always be there for them. We did start to shift a lot of our focus, a lot of our messaging, and a lot of positioning, though, to work and professional use cases. .
JD: At least having people think about that we believed the sweet spot and the absolute best use of Trello was for work and working with other people, no matter what kind of work that would be. So we started to make shifts in the positioning and the messaging along those lines. Again, while we serve just about anyone in the smallest businesses and individual users, we also some very interesting and sophisticated large enterprises. I think it’s something in the ballpark of a high percentage of the Fortune 500 companies had hundreds or thousands of users of Trello. Ander: Yeah. Google’s on that list. There are a number of companies. JD: Yeah. And many that aren’t even in the tech world, right? Manufacturing companies and all sorts of railroad companies. Things like that. Really all over the map. So we did definitely shift sort of towards work. We started to do some things to speak more to some of those enterprise customers as well. But that’s always a challenge. You don’t want to alienate your small customers and make it feel like you’re moving up enterprise. We just wanted to expand the overall picture and not really move from one market to another. Ander: And that opens the door to this other conversation about moving from the free product to the premium product, getting people to start paying for a tool. On this podcast, Advertising Influencers, I’ve talked about this with Bitly, I’ve talked about it with Grammarly – both tools that have an awesome free product just like Trello. But unfortunately – or fortunately, depending on how you look at it – in order to monetize that, you have to start moving people towards a paid plan. Obviously the most money is going to be in those enterprise plans. Ander: How do you do that? How did Trello do that? JD: Good question! I wish I knew! Haha. The initial thing they started charging for really came because customers, quite frankly, begged to pay. Customers started asking, ‘Hey, how can I give you guys money because I’m really relying on this thing and I don’t want you guys to just go out of business one day and it disappear. I want to make sure Trello stays here and stays alive and so can I give you money?’ I think the initial name of the feature or the plan that they first had was actually ‘tip jar’ or something like that. Maybe that was the internal name. I don’t remember. But it became something we had called ‘Trello Gold,’ which really was just you got a few bells and whistles, a few extra things, background images, stickers, things like that for your cards. Eventually some extra integrations and other things like that. We started charging a very minimal amount of money. I think it was $5 a month for Gold. But then, as we started seeing more and more that people were using this for business and real businesses were starting to have real usage of Trello, then the idea came to start figuring out some plans that make sense for businesses. For those who were extracting the most value from Trello, let’s figure out a way that’s fair that they can give us some value back, right? That we can charge them for that amazing value that they’re getting. So, eventually we added our business class and enterprise plans. The thinking at Trello may be different from a lot of other freemium services. The way you end up paying wasn’t really necessarily as much about hitting a wall or hitting some limit. The easiest things we could have done to juice revenue or to goose up revenue would’ve been to limit the number of boards that someone can have or the number of users they can invite. And quite frankly, that probably would have got the company to a much higher revenue level faster than it is now. But we thought that with the long term and the vision and getting to 100,000,000 people and all these things, that wasn’t the right move. We wanted people to have the full experience of Trello and not be limited by having to pay. We wanted them to create more boards because ultimately that generally brought more people to Trello. The number one way people come to Trello and sign up for Trello is getting invited by someone else’s board. Ander: Very important for enterprise. JD: Right? Haha. And you don’t want that. That’s the kind of stuff that became in our paid plans. There was a little bit of limiting around integrations, because that’s another thing that the paid plans, you get access to a lot more of what Trello refers to as ‘Power Ups.’ But advanced features or often times integrations, became part of those as well. Let’s take a step back from Trello and speak about the marketing space as a whole, especially around advertising. To whatever degree Trello or Zendesk or Marketo or any other company, to whatever degree they were involved in that advertising, how important do you see advertising personalization being moving forward? How is it going to change? JD: I mean, it’s critically important. I will say, for most of the companies that I’ve been at, including Zendesk and Marketo, advertising in the sense of display ads or any kind of traditional advertising, those sorts of things came pretty late in the game. We got to a pretty substantial place in terms of size and revenue and customer base well before doing too much of that type of advertising. I think all the companies other than Trello that I’ve been at did at least AdWords and search marketing fairly early on to make sure we were there, to capture that very specific and directed demand that comes through search. But in terms of display and even retargeting, things like that came a little bit later. Again, I think that just depends on your business and how good the organic growth is all those sorts of things that you’re seeing, that determines how early you should get into it. I think once you do get into it – and we’ve certainly experienced this at Zendesk – the more personalized you can be, the better. There’s just no question about it. If you’re an enterprise-focused business and you’re probably dabbling in the world of account-based marketing, having very targeted ads that speak directly to that company or to their specific use cases or needs can create huge returns on that. I mean, it always tests better. It always shows better. So even if you can do something at a company or a use case or a segment level, maybe not even down to just the individual person level, but if you can personalize even to one of those broader things, you’re going to get a lot better success than just the one size fits all with putting one message out there. But also, a lot of this really depends on your specific business and what your target market is when it comes to advertising and how effective you can be. Ander: Yeah, absolutely. And where is marketing going in general? What are we going to see happening in a year from now? Five years from now? Ten years from now. Whatever it is? What is the direction that you see growth and marketing and breaking through the noise going? JD: I’ll pull the crystal ball here, but I think there’s a couple of things come to mind. One is just the continuation of what I hit on earlier of marketing becoming this much more blend of art and science. And, in fact, I think actually the pendulum might already be or is probably going to swing a little bit back to the art side or the creative side. Ander: I was just thinking that. JD: A little bit. It’s been amazing that we’ve been able to bring more data, sort of, more scientific, more mathematical-type thinking into marketing. And that was extremely necessary and certainly came out of us having this thing called the internet where we could actually get data and measure and better understand what people are doing. JD: I think in some cases I’ve seen that pendulum has now swung so far that companies have sort of lost the human-ness of marketing. To me, the best marketing always comes down to being able to make true human connections and ultimately help people. I think it’s going to be interesting. There’s going to be continued advancement on what we can do and what we can understand and analyze with data. There’s going to be new technology we don’t even know about today. The fact that we’re sitting here doing a podcast, five years ago I would have never dreamed of it, right? So there’s going to be new channels, there’s going to be new technology and we’ll be embracing and figuring those out. But I think there’s also going to be this pendulum swing. And again, we’re already seeing it. Instapage is a great example of putting a big emphasis on design and putting a big emphasis on the quality of content and that sort of thing. I think that’s definitely going to come back. Creativity is what’s going to help you stand out from the noise – creativity and helpfulness. I always go back to the word ‘helpfulness.’ In everything we do in my marketing teams, that’s the one thing I want to always emphasize with people. How does this help? And not us. How does this help our target customer? If you’re going to write a piece of content, I don’t honestly care about the clicks and the short-term value we’re going to get of stuffing it with SEO keywords or what have you. Is that piece actually going to help somebody? Is it going to help them solve their problem? Is it going to help them do better at their job, talking in a B2B context? I think if you keep your sights there, and you continue to be as helpful as you can, and you do it in a creative and unique way, that’s what’s going to stand out from the noise. And that’s what’s going to get people paying attention to your brand. Ander: Awesome. I completely agree with you and I think that all the personalization that we are engaging with right now, we’re seeing kind of taking over marketing in some ways, is only going to get stronger, and is only going to get more important. Ander: JD, it has been such a pleasure having you here. We’re just about out of time but thank you so much for coming to our office. Is there anything that as the worldwide listening audience of this podcast, marketers in general, is there anything that we can do for you, for Trello, or for marketing as a whole? JD: Haha. I don’t know if there’s anything you can do for me. I think myself, like all marketers, we we’re looking for that the thing? The best art is stolen, right? It’s inspiration. The last few weeks I have been talking to lots of different companies and meeting lots of different people. It’s just amazing, some of this stuff that you see out there and people really pushing the boundaries of what’s possible. It’s very inspiring. That’s the only thing I would ask, is for people to keep pushing the envelope of what’s possible and keep inspiring others as well as myself. I guess anything we can do to keep that rain away. Let’s keep that happening too. Ander: Haha right. Well JD, once again it’s been a pleasure having you here. Thank you so much, once again. JD: Absolutely! Big fan of Instapage. Love what you guys are doing. And great to be here and be a part of this.